Is it time for some changes for the Bulls? Doug Collins has proven to be a coach with the ability to come in to a new job and make a short-term impact. So when his Philadelphia 76ers started out the season 3-13, it was clear he had his work cut out for him. However, his team has turned things around since then, going 8-3 over their past 11 games. On Tuesday at the United Center, Collins shared a story from when he played on the 1972 U.S. Olympics team in Munich, West Germany that he likely conveyed to this Sixers group. However he made his point, Collins’ emphasis on defense has paid off. During their first 16 games, the Sixers allowed 101.8 points per game. In their last 11, opponents have only managed 88.0 per contest. 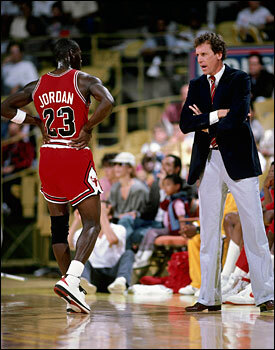 Collins’ NBA coaching career began in Chicago, when he was named head coach of the Bulls on May 23, 1986. Collins took the Bulls to the playoffs in his first season and guided them to 50 wins in 1987-88, marking the franchise’s first 50-win season in 14 years. In his third and final season with Chicago in 1988-89, the Bulls advanced to the Eastern Conference Finals. When asked about how his coaching style has changed since that time, Collins shared a conversation he had with Neil Funk, the Bulls’ play-by-play announcer. Though he only coached three seasons in Chicago, Collins said it feels as if it were 30 the way the city continues to embrace him. Speaking of Reinsdorf, Collins disclosed that he received a text from the Bulls Chairman earlier in the day, saying the Sixers were catching the Bulls at a bad time because of their injuries. “He said, ‘Good luck once you leave Chicago,’” said Collins. As for the team he once coached, Collins believes they will be a force to be reckoned with in the East once injured center Joakim Noah is back in the mix. For Sixers rookie guard Evan Turner, the No. 2 pick in last summer’s draft behind John Wall, it’s also a homecoming of sorts. Turner was born in Chicago and attended St. Joseph High School in Westchester before moving on to Ohio State, where he claimed 2010 National Player of the Year honors as a junior. “It’s super cool to have the opportunity to be around my friends and family and have them come watch me play,” said Turner of being at the United Center for the first time as a pro. As is typical for so many newcomers to the league, Turner’s first season has been filled with ups and downs. During a five game stretch when Andre Iguodala was injured, Turner averaged 12.8 points, 8.2 rebounds and 2.8 assists in 37.0 minutes per game. However, over his past 12 games played, his numbers have dipped to 2.7 points on 32.5% shooting from the floor. One of Turner’s high school teammates, University of Illinois guard Demetri McCamey, is someone he keeps close tabs with, as well as several of his former Ohio State teammates. While McCamey flirted with going pro last summer, he decided to return for his senior season in Champaign. Chicago won the season series last year 3-1, for the first time since the 2006-07 season (2-1) … the Bulls are 3-7 versus the Sixers in overtime, most recently falling 106-103 in overtime on Feb. 3, 2010 … the last time there was a series sweep in this series came in 2003-04, when the Sixers went 4-0 against the Bulls … the Bulls are 7-10 against the 76ers in their last 17 meetings at the United Center … Chicago is 31-62 all-time versus Philadelphia in the City of Brotherly Love and 52-46 in the Windy City … last season, Derrick Rose averaged 21.0 ppg, 5.8 apg, 3.3 rpg and 37.8 mpg in four games against the 76ers; he also shot .500 from the floor … in four contests versus the Bulls, Andre Iguodala averaged a team-high 20.8 ppg, 5.8 rpg and 5.0 apg in 38.3 mpg … the Bulls have not swept the season series versus Philly since 1996-97, when they went 4-0.